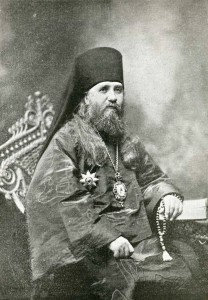 Editor’s note: The following homily, by St. Tikhon, was published in the March 1902 English supplement to the Russian Orthodox American Messenger, the official periodical of the Russian Diocese. From the reference to St. Macarios the Great, we can date this homily rather precisely. The feast of St. Macarios is January 19. St. Tikhon mentions “evening songs” (Vespers hymns) to St. Macarios, which means that this couple was married on the eve of the feast — January 18. Of course, this would have been on the Julian Calendar; adding the requisite 13 days, we come to January 31, 1902 by American reckoning. Another thing I noticed, when reading this homily, is that the marriage in question appears to be between an Orthodox man and a non-Orthodox woman. I could be reading too much into this, but at the outset, St. Tikhon says, “[A]s for thee, beloved bridegroom, being a servant of the Orthodox Church…” And in closing, St. Tikhon tells the bride, “And thou, oh wife, takest a husband not merely from the edifice of the church, but from the rank of the servants of God.” It sounds quite likely, then, that the bride was not herself Orthodox. I don’t know where this homily was given. I suspect it was in San Francisco, the headquarters of the Russian Diocese in 1902. This could be confirmed by looking at the metrical books of the San Francisco cathedral. In greeting you, my beloved in Christ, on the occasion of your marriage, I also intend to say a few words for your edification. The Holy Church prescribes, in the marriage ritual, to offer to the people about to be married an edifying word by telling them what the sacrament of marriage is, and how they are to live, in matrimony, in righteousness and honor. A good deal is said about matrimony and family life, especially of late, but it is not always sane words that we hear. Therefore people ought firmly to know and to heed, and as for thee, beloved bridegroom, being a servant of the Orthodox Church, thou oughtest to teach as well what is the sacrament of matrimony, in righteousness and honor. It is not good that the man should be alone: I will make him a help meet for him (Genesis, 2, 18), said God Himself, when our forefather Adam was still in paradise. Without a helpmate the very bliss of paradise was not perfect for Adam: endowed with the gift of thought, speech and love, the first man seeks with his thought another thinking being; his speech sounds lonely and the dead echo alone answers him; his heart, full of love, seeks another heart, that would be close and equal to him; all his being longs for another being analagous to him, but there is none; the creatures of the visible world around him are below him and are not fit to be his mates; and as to the beings of the invisible spiritual world they are above him. Then the bountiful God anxious for the happiness of man satisfies his wants and creates a mate for him — a wife. But if a mate was necessary for a man in paradise, in the region of bliss, the mate became much more necessary for him, after the fall, in the vale of tears and sorrow. The wise man of antiquity spoke justly: two are better than one, for if they fall, the one will lift up his fellow: but woe to him that is alone when he falleth; for he hath not another to help him up (Ecclesiastes 4, 9-10). But few people are capable of enduring the strain of moral loneliness, it can be accomplished only by effort and truly not all men can receive this saying, save they to whom it is given (Matthew 19, 11), and as for the rest — it is not good for a man to be alone, without a mate. The wife is the mate for her husband. Living chiefly with her heart, the woman is the best mate for the man, his best friend, consoler, and help, with the tender love, resigned loyalty, gentleness, longsuffering and sympathy proper to her heart. In the properties of woman’s nature, man finds the counterpart of his powers, of reasoning, firmness, character, and from a good wife he receives support and encouragement: there is no heavy labour, no bitter circumstances to which a man cannot be reconciled by a loving wife. This the ancient philosopher says, that he who acquires a wife, acquires a help and a support for peace; grace upon grace is a modest wife and she is priceless! A virtuous wife rejoices her husband and fills his years with peace; the amiability of the wife will gladden her husband, and her reasonableness will strengthen his bones; with her the rich man and the poor has a contented heart and a merry face at all times (Syr. 26, 1-14, 16-18; 36, 26-29). Live joyfully with the wife whom thou lovest, which He hath given thee for that is thy portion in this life and in thy labour (Ecclesiastes 9, 9). This means, that matrimony is perfect and acceptable to God, but only when at its foundation there is no desire of material gain, no low impulse, but the mutual love and devotion of the husband and wife, joined to self-forgetfulness, constancy, gentleness, patience, when the husband loves his wife and takes care of her, and the wife respects her husband and obeys him, as the head, which the Holy Church also demands from them (Ephesians 5, 22-29). Moreover, in order to be acceptable in the eyes of God, marriage must be entered in only in the Lord (Corinthians 7, 39), the blessing of the Church must be called on it, through which it will become a sacrament, in which the married couple will be given grace, that will make their bond holy and high, unto the likeness of the bond between Christ and the Church (Ephesians 5, 23-32), which will help them in the fulfillment of their mutual duties. Sometimes, as for instance in this country, Church marriage is deemed unnecessary. But if without the help of God we can accomplish no perfect and true good (John 15, 5), if all our satisfaction is from God (II Corinthians 3, 5), if God produces in us good desires and acts (Philippians 2, 14), then how is it that the grace of God is unnecessary for husband and wife in order honorably to fulfill their lofty duties? No, a true orthodox Christian could not be satisfied with civil marriages alone, without the Church marriage. Such a marriage will remain without the supreme Christian sanction, as the grace of God is attracted only towards that marriage, which was blessed by the Church, — this treasury of grace. As to the civil marriage, it places no creative religious and moral principles, no spiritual power of God’s grace, at the basis of matrimony and for its safety, but merely legal liabilities, which are not sufficient for moral perfection. Your matrimonal bond, my beloved, is blessed to day by the Holy Church, and the grace of God has been imported to you, through the priest of God. And thou, oh wife, takest a husband not merely from the edifice of the church, but from the rank of the servants of God. Accordingly we hope and pray the Lord, praised in the Holy Trinity, that He grant you long life, fecundity, perfectioning of life and faith, perfect love and that He fill youwith all the good things of the earth and make you worthy of the promised bliss of reception, through the prayers of the Holy Virgin, with whose image I bless you, and of all the saints. Amen.